Suresh Sethi, University of Washington doctoral student, has experience as a commercial fisherman, taking part here in the Bristol Bay, Alaska, drift gillnet salmon fishery. 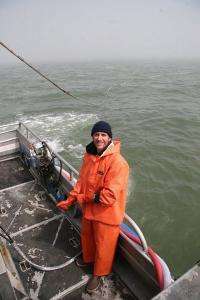 (PhysOrg.com) -- People who fish for a living pursue top profits, not necessarily top predators, according to the first-ever analysis of worldwide catch and economic data for the past 55 years. "We wanted to examine why fishermen might be motivated to preferentially harvest different trophic levels and our data showed that fishing down the food web -- by moving from higher to lower value species -- is an incomplete story of the evolution of global fishery development," says Sethi, lead author of a paper on the subject published this week in the early edition of the Proceedings of the National Academy of Sciences. "We found no evidence that humans first developed commercial fisheries on top predators then sequentially moved to species lower in the food web since the 1950s. Instead, those who fish for a living have pursued high revenue fisheries, no matter what the tropic level of the species." It's important to know what motivates those who fish for a living as nations move toward ecosystem-based management, Sethi says. "Attributes related to economic opportunity will be important for understanding which species are susceptible to new fishery development or expansion of existing harvest when costs and benefits are altered, for example, through government subsidies," the paper says. Co-authors are Trevor Branch, UW research scientist with aquatic and fishery sciences, and Reg Watson, senior research fellow with University of British Columbia, Vancouver. It was the late 1990s when University of British Columbia's Daniel Pauly published findings in Science magazine that said global landings of fish included more species from lower trophic levels. In discussions that followed, it was assumed that this was because fish at the higher levels fetched the best prices and, as they were depleted, fishers had to turn to lower-value fish that also are lower on the food web. Work published in 2006 challenged the idea that the largest fish were, in fact, gone. The work led by UW researcher Tim Essington documented that, in the majority of ecosystems studied, when the catch changed to include fish from lower trophic levels, the catch of fish higher up the food chain stayed the same or increased. Take price. The authors divided fisheries into three groups and used a worldwide economic database to find that average prices for the lowest trophic levels, which includes pricey shellfish such as shrimp and abalone, were 25 percent higher overall than fish at the highest trophic level. Prices for the lowest level were 45 percent higher than for the middle group, which includes fish like herring. In the drive to catch fish with the best economic value, species that are super abundant present some of the best opportunities. Alaska pollock, for example, are caught in great quantities in the Bering Sea and are a very valuable fishery even though the fish is inexpensive to buy and not high on the food web. Similarly, species found in shallower water were targeted first because they are less expensive to catch and therefore profitable even if they don't fetch top prices, the researchers said. The fishing industry also preferred larger-body fish that can be made into more kinds of products, some with higher values. Taking fishing motivation into account should help make plans for sustainable harvests more reliable. This is of growing importance in a world where fishing is a mature industry and the potential for new fisheries is very limited, co-author Branch says. "Our research revealed that nearly all high-catch fisheries are already developed, and that few new high-catch or valuable fishing opportunities exist today," Branch says. "Total revenue from new fisheries dropped 95 percent from 1950 to 1999. Meanwhile, fisheries already developed by 1980 contribute more than 90 percent of both catch and total revenue expected from marine fisheries today."